New Homebuyers Face A Friendlier Housing Market, Thanks To Cooldown In many parts of the country it's actually gotten a bit easier, though not any cheaper, to buy a house. Housing sales are down nationwide, and the market is cooling off. 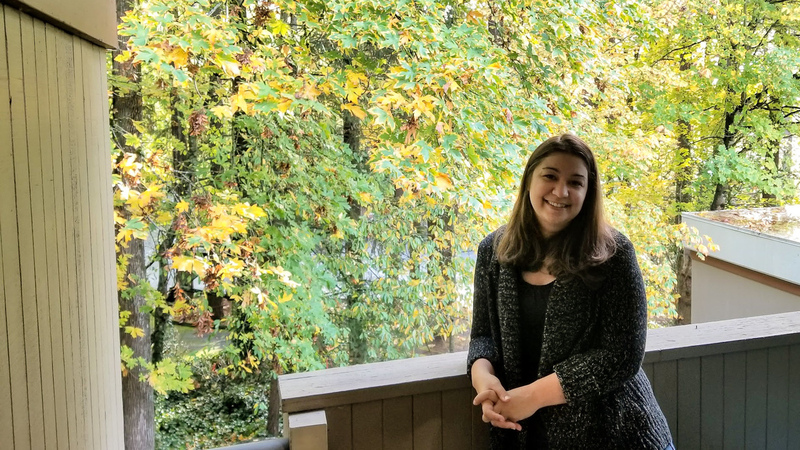 Sara Murawski, pictured on the patio of her new condo in Portland, Ore., has been dreaming of homeownership for two decades. This year, she became a first-time homebuyer — seeing first hand how Portland's red-hot housing market is starting to cool and become a little friendlier to buyers. Since she was 12 years old, Sara Murawski has dreamed of buying a house. Specifically, a Craftsman home, with a big front porch. But she graduated right before the Great Recession. When home values plummeted, she couldn't afford to take advantage of lower real estate prices. She was working in construction, with bachelor's degrees in housing studies and interior design. "My wages weren't that great," she says. "I just felt really lucky to have a job." By the time Murawski could save for a down payment, prices were increasing rapidly. She wasn't the only millennial who had delayed home-buying. Everyone was entering the market at once, and there weren't enough houses to go around. The fierce competition for homes drove prices up — and kept Murawski from wading in to the market. Her experience was not unusual. In recent years, in the U.S. as a whole, home sales have been increasing, and housing prices have been rising more quickly than incomes. The trend is exaggerated in urban metropolitan areas from Los Angeles to New York City, including Portland. Lawrence Yun, chief economist at the National Association of Realtors, says that homeowners were profiting from the booming market. "But for the renters and first-time buyers who want to participate in the American dream of ownership, it has become much more difficult, with prices rising too fast," he says. Now, though, things have started to shift. It's not that houses are becoming more affordable. In fact, as mortgage rates are rising, it's getting even more expensive to buy a home. But those rising rates are having an impact. The runaway housing market is starting to hit the brakes. Home sales have been decreasing across the U.S. for several months. You can call that trend a slump, or a correction, depending on how you feel about it. But it's not a crash. And, if the economy remains strong, the slowdown might be an opportunity for first-time buyers who have been sidelined by the booming market. That's what happened to Murawski, in Portland. This summer, she saw the intense competition for homes was starting to cool. Prices were still high, but she wasn't willing to wait any longer. "I had been watching the market ... . I've been following it pretty closely," she says. "I just felt like another opportunity might not come up for me." Murawski took a day off work and called a real estate agent. Soon, she fell in love with a place — not the Craftsman house of her dreams, but a condo with an elevated patio and a view of the trees. She made an offer. And the next day, it was accepted. The seller even paid her closing costs. It was fast, compared to what some homebuyers have gone through. She went from first looking at houses to having her offer accepted in about two weeks, she says. No bidding war required. Josh Lehner, an economist with the Oregon Office of Economic Analysis, says that Murawski's experience in Portland is representative of what's been happening across the country — except the rise in the city's real estate prices was more intense. The growth trends in Portland over the last decade have been "supercharged, relative to the national trends," Lehner says. In part that's because of higher-than-average income growth. The pattern "is the exact same, it's just more pronounced," he says. And the recent cooling started a little early in Portland. In September, as price growth was slowing in cities across the country, Oregon Live noted that "major metropolitan areas are following the pattern seen earlier in the Portland area." Nationally, sales of both new and existing homes have been declining for the last four months, and homes are taking longer to sell. And while the prices of homes aren't declining yet, they've at least slowed to a more moderate rate of growth in cities where housing values had been skyrocketing. Analysts say the biggest factor is the change in interest rates. Average mortgage rates are approaching 5 percent. That's a full percentage point higher than they were a year ago. "For a consumer, a typical homebuyer at a typical sort of mortgage size, that means about $150 a month in higher payments for the same price home," says Len Kiefer, deputy chief economist at Freddie Mac. But he also wants to keep that increase in perspective. "Mortgage rates above 5 percent may seem very high," Kiefer says. "You know, over the last seven years they have rarely been that high. ... But historically, [those are] some of the lowest rates ever seen." And, like economist Lawrence Yun, Kiefer says that houses had just grown too expensive, too fast. As for what happens next, analysts agree that affordability will continue to be a challenge for would-be homebuyers in major markets. But if the economy remains strong and the housing supply increases, the slowdown in sales could eventually lead to prices rising at a more moderate, sustainable rate. "Maybe the housing market has a good story over the next couple of years," Kiefer says, "if we can figure out a way to supply housing at an affordable price."